Okay, for once I’m not completely on board with a tip. Because while there are lots of people who said they’ve had great success with using mayonnaise as a hair conditioner, there have also been accounts of this method being gross, stinky, or just plain useless. If you want to try this for yourself, do note that you’ll have to use only REAL mayonnaise, and not a salad dressing substitute (like Miracle Whip). And since none of this mayonnaise will go to your thighs, reach for the FULL FAT ones while you’re at it. Step 1: Get full-fat, real mayonnaise. Not the low-fat/diet variety. Step 2: Put a healthy glob of the mayo on your palm and slowly work this through clean hair. It’s fine to put it on damp hair, and might actually make it easier for you to work the mayo in. Step 3: Put on a shower cap if you have long hair so that you don’t get mayonnaise all over your floor/couch/clothes/other people/pets etc. Step 4: After a good solid hour, wash the mayo off with regular shampoo and cold water. Shampoo thoroughly because leftover mayonnaise in hair is not a good idea. Shampoo twice is best. Towel gently and let your hair dry on its own. If you have a lot of build-up in your hair from products like mousse, leave-in conditioner, hairspray, hair wax, oils, hair gels (ok you get the idea), then this one's for you. This is actually a good tip and it works fine. I tried it once— but I just can’t get the awful smell of mayonnaise of my hair. Ugggh! Vinegar is actually good for the hair too- but got the same problem- it smells like hell. How did your hair come out? It’s the oil content of the mayo. Less unstable/perishable oils are better – olive, sunflower or almond oil. Did your hair come out bad like you though it would or did it come out good? Did it come out shinny with no split ends? I want to try that but i dont know since i have tried alot of things before that made my hair worse! I tried. I had hard time getting beyond the scent; and then my hair felt softer for a couple of days. I have naturally thick silky asian hair. For a while, I just could not figure out why my hair felt.. like not behaving the way it used to. It turns out Mayo also gave me the unnecessary amount of oil and the build-up afterwards. It was very very frustrating. I had to chelate for several times. Triers beware, it is not for everyone. hi,its really really works…i have tried it…n i am loving my hair..
i am using it right now its in my hair! !…..waiting to rinse it out… hopeing for good results! Doing it now, a little scared, a little smelly, kinda want a sandwich…. Definatly try this! Me and my mother do this all the time, and we have glowing healthy hair. Although hair can smell a little but, hey. You have to pay the price. Omg! Ive just tried this tip and blow dried my hair and its so smooth and silky! I always use mayonnaise on my hair but i add a drop of olive oil in with it, works wonders. this is so amazing. it works really well. my hair is super thick and nasty after using this jk it works so well no it doesnt or does it?? My hair use to b down to my back n i got the stupid brazillian blow out n completeley dired oit my hair and destroyed it!!!!!!! Vefore i got it my hair was cut to about 2 inches longer than my shouldeers and now its above my shoulders dry spit ends and horriflying im sick n tired of it i hate being made fun of and i want something tht works!!!! I need good healthy hair pronto!!!!! Idk wat to do anymore!!! I tried using mayonnaise in my hair since I was told that it work wonders to dry hair like mine. I am amazed with the result. My hair is shinier and thicker. From now on, I’ll use it as my conditioner and I’ll just use a baby shampoo. can i get mayonaise from general store ? You wanna apply it similar to conditioner. Not to much otherwise its hard to get out and leaves your hair oily and greasy. Make sure to get it from roots to tip and If you have long thick hair like me it can take up to 3 shampoo’s to rinse it clean. Only shampoo your hair afterwards though don’t put any conditioner. Works well! My hair was dry and wouldnt style very well. The mayo made it soft, shiny, and great to work with! Have to wash it all out though, otherwise it’ll make your hair oily and gross! Great!!! how to control my hair fall.. give any solution..
Good to hear it worked well for you — mayo on hair seems to get mixed responses. Some love it, some hate it. I also have intentions to dye it some funky colors in the future so I’m hoping this comes out alright to help later. I had a bad dying experience this summer that required 8 hours in the salon of stripping and dying to get it back to a natural color. Somehow, though my hair stylist was shocked, my hair did not fall out at all and had little to no breakage at the ends. So my hair is sturdy,but the texture is still awful with zero gloss. Carly, if this does not work for you, try ‘Silk Therapy’ shampoo & conditioner by Bio Silk!! I’m in my 60’s & have had hair like yours, all my life. About 6-8 months ago, I got fed up with it, paid a little more for the Silk Therapy, but I will NEVER use anything else! For the 1st time in my life, I have hair that feels like REAL hair , not dry coarse straw. For the 1st time ever in my life, has a man run his fingers thru my hair and said….I like you hair! I was in a hurry one morning, so I used Pantene shampoo/condition (in one). I was upset all day, because my hair was so crappy. Please, please, give it it a try! You will not be sorry. I wish I had known about it 30 years ago. Hmmm I don’t know your definition of “easier to find”. 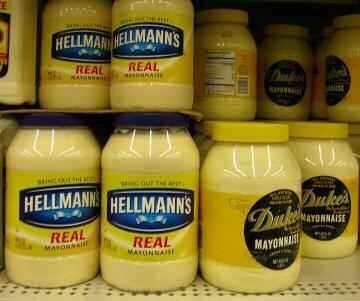 I would think that mayo is quite easy to find in most supermarkets. Another popular option is coconut oil. To make it easier to use, skip the leave-in method and just apply a very small amount to your hair each day. If the oil is too thick, just rub it between your palms first before running them in your hair. Well, I’m going for it! How many times should use this mayo treatment because i used 2 times but there s no changes in my hair… can you anyone help me… how to make my hair silky and shiny… which shampoo and conditioner suitable for my hair… my hair s so dry and little curly… please help me please… am very worried about my hair..
how many times a week i use mayonaise on my hair? I usually do it once or twice a week. I also mix it with 1 egg, some essential oils (jojoba & almond) and organic milk and leave it on for about 1-1.5 hours. My hair is exceptionally soft and shiny afterwards, I love it! Awesome… and thanks for sharing your recipe! Excellent post! I’m a huge fan of using mayonnaise as a deep conditioning treatment and find that it works wonders for my hair. Highly recommend shampooing afterwards because the smell isn’t exactly great and also keeping the hair mayo separate from food products so that there’s no contamination. just used mayo on my hair! And wow it has a great result! :) got shiny, silky, soft and manaegable hair. Love it! Baby shampoo is the worst stuff you can use on your hair. It’s recommended if you want to strip hair-coloring from your hair. People think it’s gentle because it is for babies, but it’s not, it’s actually one of the strongest shampoos on the market because of its PH. The best stuff to wash with is vinegar. So I tried this yesterday right after I read it. I have been being the no shampoo thing for a good 8 months now. The first couple months were hard. My natural oils insanely over produced and I started the baking soda and ACV approach but tha seemed to leave my hair kinda stiff. So I would only do that once or twice a week. I recently started to notice my hair seemed dry. My ends were ruff…but thats b/c I haven’t had my hair trimmed in a long time. Which is very healthy for hair growth…something I never really knew. So anyways this is what I did yesterday. I did a quick at home hair trim. (I looked online how to trim my hair at home) I applied and thoroughly massaged real mayo to my scalp and damp hair. I would say about 4-6 Tbps. I have shoulder length hair. Wrapped my hair in a bag and left it in for about an hour. (washed dishes, cleaned the house, read more stuff from this site) Washed it out with warm water. M hair still had alot of oils left in from the mayo but I just tied it up in a pony tail. It is hard to get all the oils out with just warm water. But I figured leaving it in until later on that night would be like a leave in conditioner. So I went to work with hair in pony tail. So that was a good 7 hours with some oils still in my hair. (it did look shiny/greasy…so it’s up to you how you would go about it. But I didn’t mind going out of the house like that) When I got home I took a shower. Thoroughly massaged my scalp and hair again then massaged my ACV mix into my hair, rinsed that out, then massaged my baking soda mix into my hair, rinsed that out. My hair felt amazing and still does!!! It is like silk!!! Light soft shiny smooth!!! It hasn’t felt like this in a long time. I know this is a long comment but I had to share my experience! My new cheap hair treatment is mayo! Loving it! Also one more thing. As I was reading over some comments on here. I have strange straight yet wavy hair. I use a 100% ceramic straightening iron on my hair. I just straightened my hair this morning and it is still silky soft and shiny. It feels feathery light. So if this mayo treatment is great it makes my ends look soft and straight and after straightening my hair my ends didn’t look damaged at all. Another helpful hint is that the ACV and baking soda is what gets that oil out in one wash. No greasy after look. Unless you really over did it with the mayo. I also do a cold water rinse right before I hop outta the shower. That leaves hair shiny. Kinda like when you splash cold water on your face after washing your face with warm water it closes up the pores. That kinda the same effect with hair it seals in the moisture and gives it a nice shine. I forget where I read about that. I am just wondering why and how you use baking soda for your hair? hi! I used 2 eggs, a teaspoon of oil (forgot what it was called) and also 2 and a half cups of mayo. Oh, before I did this I rinsed my hair with warm water… it helps. Then, I put my hair in a bag and let it sit there for 30 minutes-hour (also wrapping a towel around my head to keep the heat in). Then I washed it out but did not use shampoo. When it dryed it was very soft a silky. To get the smell off I used a body wash with a strong scent (pomegranate) and let the soap soak into my skin before rinsing. The mayo doesn’t really stink because all this has mixed into it, so it didn’t take much to get the smell off. It really worked though! My hair is soft and silky! Oh and also don’t put shampoo in before 24 hours after doing it! Thanks for sharing your method, katie! Tried mayonnaise in my hair and guess what? This is the softest and shiniest my hair has ever been. One problem though- I didn’t have dandruff before and now I have. Could it possibly be because of not using real mayo? One thing I know for sure though, I definitely want to continue using mayonnaise, just without the dandruff. Hi Marilyn, I’m glad you had good results, but I don’t know why you would get dandruff from this. Did you use Miracle Whip before or some other mayo substitute? My suggestion is to try real mayo instead and see if it makes a difference. Dandruff is caused by a fungus from oil on your scalp. Mayonnaise contains oil. You might not be washing the mayonnaise off of your scalp completely. You can use shampoo to wash it out, but try rinsing with vinegar instead, it’s supposed to help dandruff, and it makes your hair shiny and smooth. Thanks so much for this I tried this earlier today while running my bath and after an hour i washed the mayo off in the shower and after my hair dried it was super soft and easier to comb through!!! Will never forget this website article!